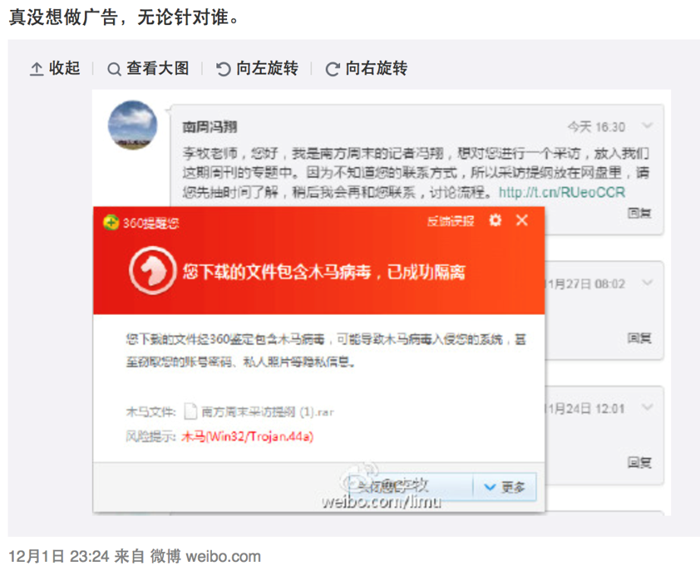 In the evening of December 2, 2015, Antiy earlier-warning monitor system perceived the following information: a famous writer released a message in the Sina Weibo (Note: Sina Weibo is the largest social network in China that specializes in providing microblog services, like Twitter), exposed that someone sent a malicious code link which is pretended as “Interview outline” file through Weibo private message function. 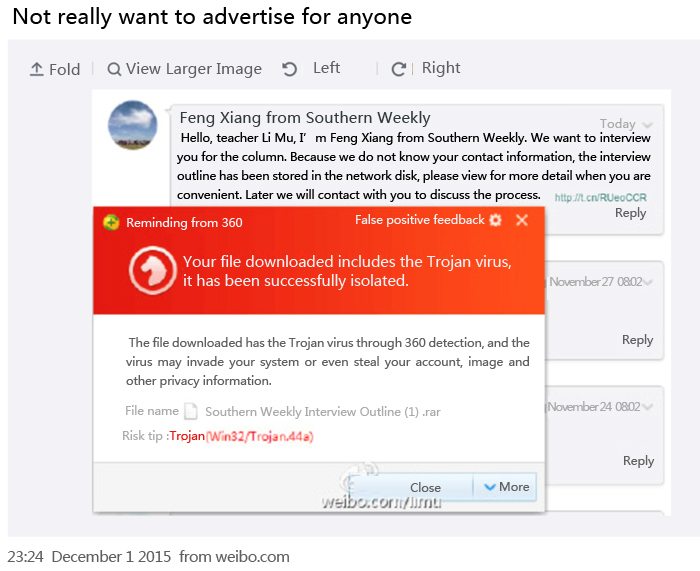 According to Weibo screenshot link, Antiy CERT downloaded the sample and performed the analysis. 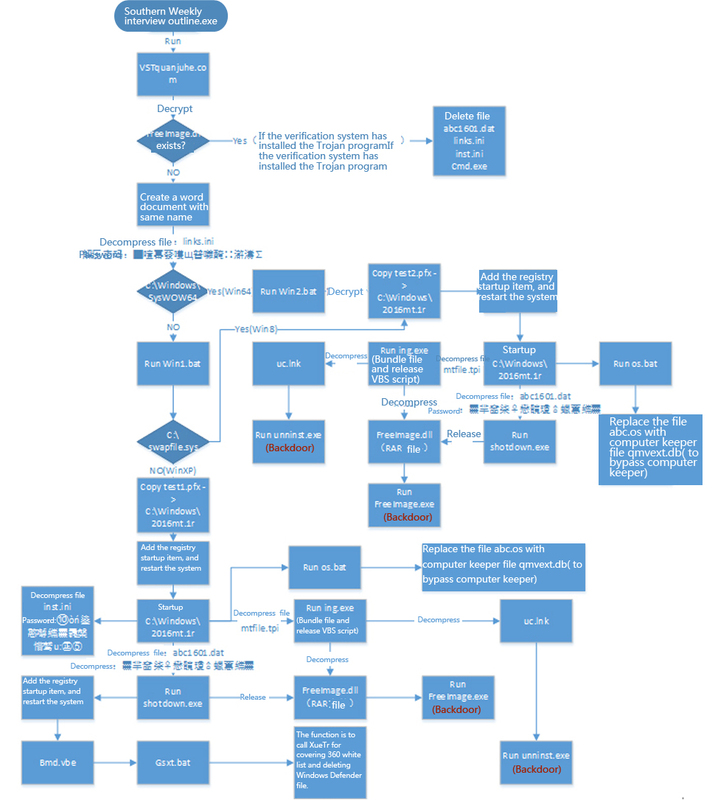 With the deep analysis, we collated the event process and its relevant malicious code mechanism. As shown, the blog was released on December 1, 23:24. A writer received “Interview outline” from a reporter called “Feng Xiang from Southern Weekly” (Southern Weekly is a comprehensive press in China), and the ““Interview outline” was stored in network disk because the report “does not known” his contact information. But, the file in the network disk causes an alert from anti-virus software. The owner of Baidu Wangpan is “Feng Xiang from Southern Weekly”; its creation time is 17:04 on November 30, 2015. At the same time, we find that another Weibo celebrity raised doubts on November 30. Although the attack uses the social engineering to cheat, but still now, no celebrities are “attacked”. We analyze the samples. 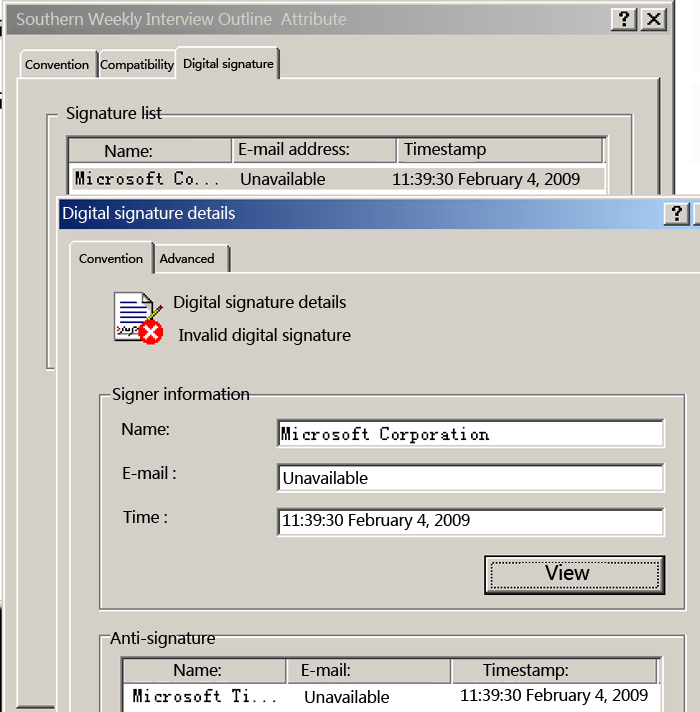 As shown, the EXE file is similar with Word document. 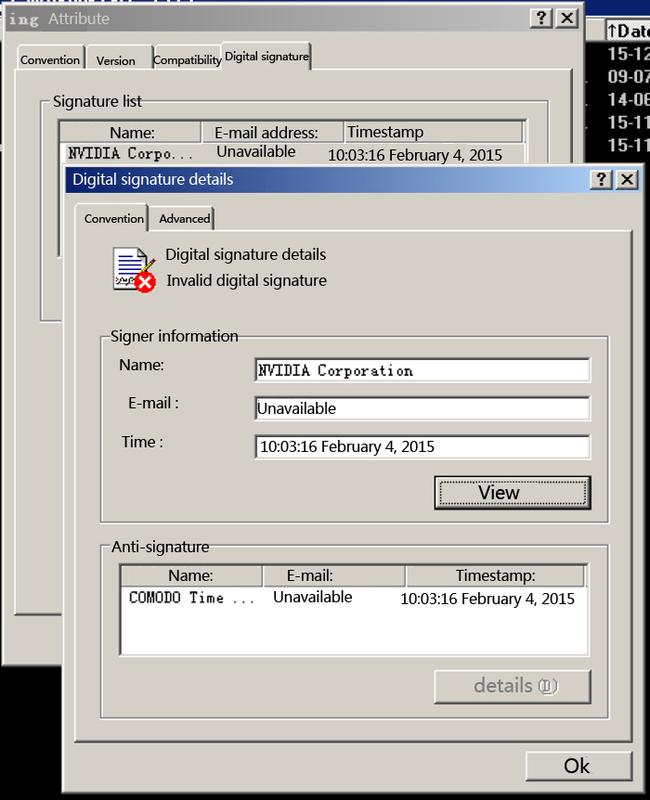 The file has digital signature, which cannot be verified online, so we suspect that a static fake digital signature has been applied. The sample is a self-extracting program, it uses more than a dozen encryption scripts to execute malicious functions, encrypts after being executed and runs unzipped program VSTquanjuhe.com. It uses identification to check whether there is “C:\\$NtUninstallKB1601A$\\BinBackup\\Images\\FreeImage.dll” to check if it is runningVSTquanjuhe.com. Use extremely complex unzip passwords to unzip links.ini and identified whether there is a folder “C:\Windows\SysWOW64” to check whether the system version has a 64-sit operating system, and 32-bit operating system and 64 – bit operating system call for different encryption scripts to execute. 32-bit operating system (except Windows 8) adds registry startup by script, and restarts the operating system, and then reuses complex passwords to decrypt multiple files. After being unzipped, the excusable file shotdown.exe，shotdown.exe will release a encrypted RAR file called FreeImage.dll. By restarting the system, it uses decryption script and manual anti-virus tools “XueTr” covering 360 security software white list file, and delete anti-virus software Windows Defender file, running unzipped files ing. exe (bundle files, release VBS script), using the ing. 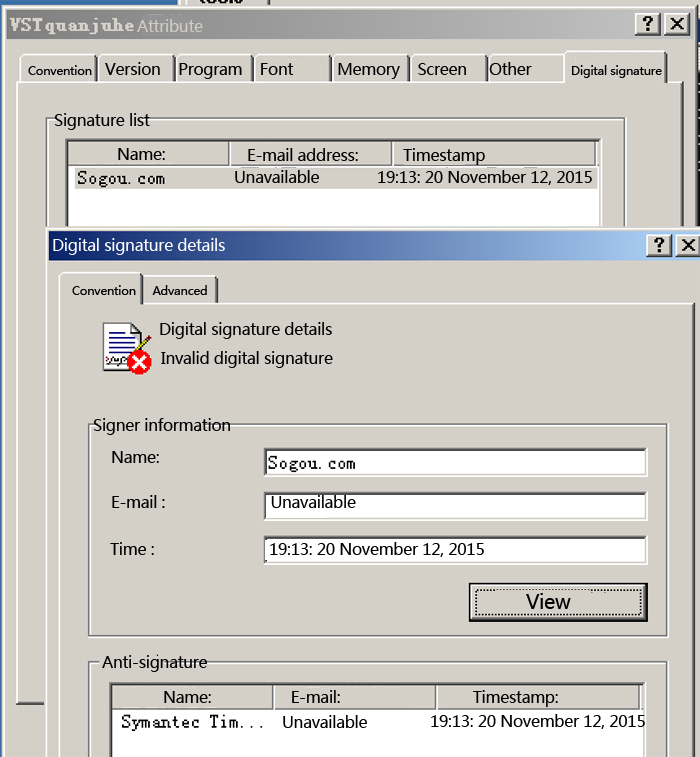 exe to release script unzipped RAR file FreeImage.dll to get a backdoor and then run. 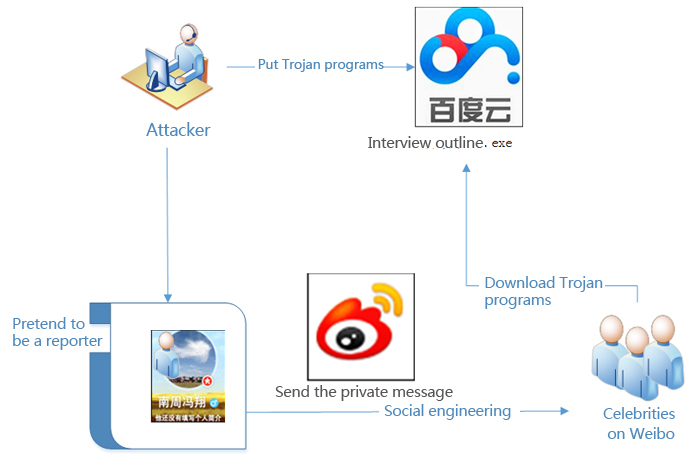 The program file can use the method of replacing files to add rules to bypass Tencent computer butler detection. The 64 – bit operating system and the branch function of Windows 8 system is the same as the 32-bit operating system. The main difference is to restart the system once instead of twice, uncover 360 security software white list file. Their ultimate goal is to run two backdoor. 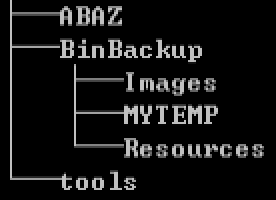 ABAZ\1.exe XueTr Command line version for BAT and VBS script calls, to duplicate and delete files. ABAZ\XueTr.dll XueTr depends on dynamic link library file. ABAZ\XueTrSDK.sys XueTr depends on driver file. Tools\ua.exe RAR command line tools for BAT and VBS script calls, to unzip the files. These derivative files are four common utility class programs. Init.ini File uses ini as extensions, but it is actually a RAR file package. Its main function is to add the registry startup: “C:\$NtUninstallKB1601A$\BinBackup\ub.lnk”. Then it calls gsxt.bat to replace the security software white list file to achieve the goal of bypassing security software killing. Therefore, it can be found that the function of inst.ini is to add ub.lnk startup, and attempt to bypass security software killing. 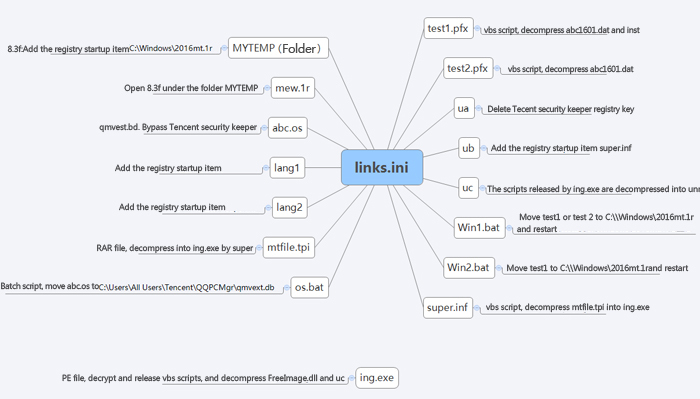 links.ini uses ini as extensions, but it is actually a RAR file package. File ua.lnk deletes the start menu and Tencent Security Steward registry entries, and modifies files with suffix as .1r and .3f , which can open in the form of vbe and inf . These two backdoor are of the same local action: enabling system program svchost.exe and injecting into it. The jumping address of the dynamic domain is 115.**.***.239. It can be concluded that the backdoors belong to the same network action and function. Meanwhile, according to the analysis took by Antiy CERT analysts on backdoor code and online data package, it can be deduced that the backdoors are generated by the same remote generator. And the remote control software is the specific version of RemoteABC that is modified by Hupigon source code. 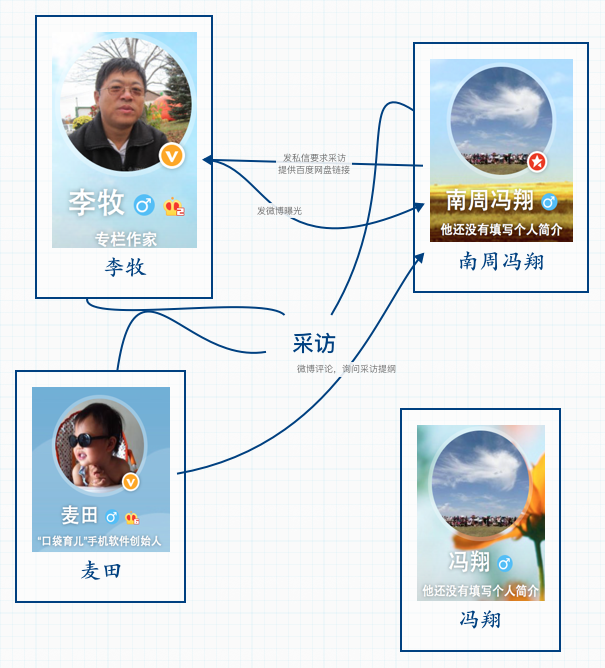 The Internet companies should strengthen the monitoring and governance of user’s fake ID. The online storage vendor should strengthen the security detection of storage content to avoid being used to spread malware. The developers of tool software should try to add obvious confirming functions of user interaction when they develop functions that might bypass or compromise system security mechanism to avoid being used maliciously. The developing vendors of security tools should release the upgrading patch immediately after they found security vulnerabilities and suggest users’ upgrading to avoid attackers’ bypassing, which would result in bringing false impression to users.